Half Diminished chords are difficult to get used to and hard to improvise over. 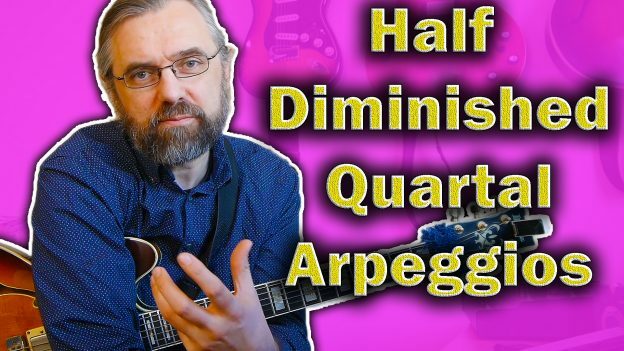 In this video I am going to go over some of the Quartal arpeggios that work great for m7b5 chords and show you how to easily add them to your vocabulary. I also go over some examples of how you might use these arpeggios over a half diminished chord in a minor II V I cadence. The first example is using two quartal arpeggios on the Eø, and another two on the A7alt. The first quartal arpeggio is from A: A D G, which gives us a m11 sound over the Eø with 11(A), b7(D), b3(G). The second one is from the b5: Bb E A basically spelling out a m7(b5(11) chord with the b5, root and 11th in the arpeggio. On the A7 altered I am using a quartal arpeggio from C and then one from C#. The one from C# you may recognize as the top part of an A7(#9). If you want to work through the Quartal arpeggios for the Eø in this key (which is D minor), then you can check out the exercise here below which includes the two I used and is covering all diatonic quartal arpeggios in the scale on the middle string set. This example is again using the Quartal arpeggio from the b5: Bb E A, and then continues with the quartal arpeggio from E on the next string set: E A D. This way of connecting the arpeggios in 4ths gives us two common notes between the arpeggios. It also creates a movement with a large range. The A7 altered line is a scale run from the root ending with a chromatic phrase that resolves to the 5th(A) of Dm6. To check out the arpeggios on the top string set you can play through this exercise. Notice that if you do this with alternate picking it is really a great way to develop flexibility! The Maj7 arpeggio from the b5, in this case a Bbmaj7 arpeggio, is making a guest appearance. This arpeggio is often overlooked but is a perfect fit for the Eø sound. In this example it is chained together with the quartal arpeggio from the root: E A D.
The A7alt lick is turning around on the #9 and then descending down the scale. Before resolving to the 9th(E) of Dm6 it catches the C# on the A7. The m7b5 or Half diminished chord is one of the chords I get asked about most often, so I hope you can apply some of these arpeggios in your own playing. If you want to see more videos exploring the options on a half diminished or m7(b5) chords then leave a comment on the YouTube video or send me a message via e-mail! This entry was posted in Blog, Lesson and tagged guitar, half diminished 7th chord, half diminished arpeggio, half diminished arpeggio guitar, half diminished chord, half diminished chord guitar, half diminished chords, how to play over a half-diminished chord, jazz guitar, Jens Larsen, m7b5, m7b5 arpeggio guitar, m7b5 licks, minor cadence, Minor II V I, minor II V I licks, quartal arpeggio, quartal arpeggios, what to play over a half diminished chord on March 22, 2018 by jens.